This month's Fantastical Food Fight's theme is "Candy"! Check out the information about this fun group, hosted by Sarah, here. I have been trying to participate in this group for awhile, but somehow things just haven't worked out - but today, today the stars are aligned and here I am! 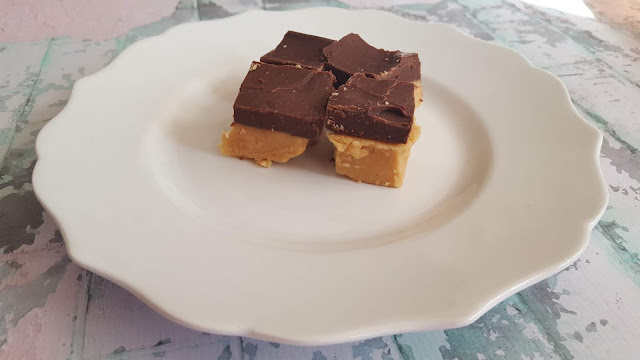 This was a delicious combination of chocolate and peanut butter in a rich, creamy fudge easy and quick to make, and enjoy! My peanut butter layer came out a little crumbly, but the flavor and creamy texture is wonderful. 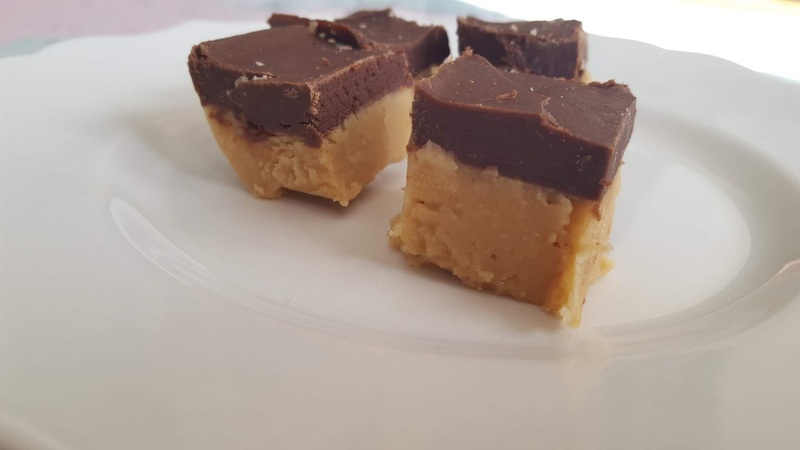 Fudge seems to be the perfect addition to any Holiday dessert platter - and if you love peanut butter and chocolate together this is a wonderful recipe to try out and share! A little goes a long way with this rich treat. I cut our pieces very small. Make the peanut butter layer first. Prep a 2-quart dish by spraying with nonstick baking spray and setting aside. In a medium nonstick pot, add the 1 cup butter, and 1 cup creamy peanut butter and over medium-low heat, stirring frequently with a spatula, melt the two together and immediately remove from heat. Stir in vanilla and sifted powdered sugar until well combined. Press into the bottom of the prepped 2-quart dish. Make the chocolate layer next by combining all ingredients in a medium nonstick pot over medium-low heat, stirring frequently. As soon as the ingredients melt and combine, stir until very smooth and then spread over the top of the prepared peanut butter layer, smoothing the surface. You can chill in the refrigerator, or allow to cool at room temp. Cut into bite sized pieces and serve within a few days of preparing. You can't go wrong with peanut butter and chocolate! It looks good to me, yum! Oooh Rebekah this sounds amazing. Nothing better than peanut butter and chocolate. Looks delicious - peanut butter + chocolate is always a win! My son just outgrew a peanut allergy a few years ago, so I'm still catching up on all the great treats I've never made. Buckeyes is one, and turning them into fudge is such a great idea! The perfect combo, peanut butter and chocolate, in one little bite. Oh now, these are just too good to be true! I love Buckeyes - my MIL makes them every year, but Buckeye fudge?! Holy smokes that's genius! Nice to see you back! I've had buckeyes on my to-do list for years. These might just be it! I love the combo of peanut butter and chocolate, these Buckeyes are my favorite.